There seems to be a huge crop of acorns this year at the nature center. 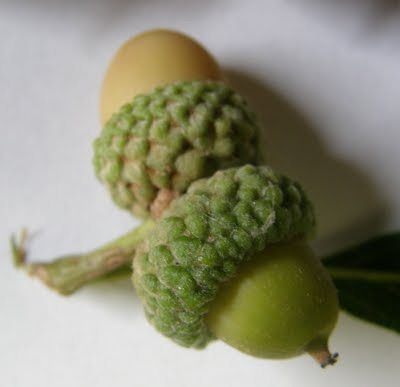 Acorns seems to come in boom or bust cycles and it is thought this is an evolutionary survival strategy. If the tree just makes a few each year they will all be eaten by squirrels and turkeys. If, however, they produce thousands all at once then the animals cannot possibly eat them all and some will survive. This abundant production is called masting. The white oaks have been dropping acorns like mad right over hte lat few weeks. The woods are alive with the sound of acorns falling. When they hit the tin roof of our sugar shack it makes an impressive sound. Acorns can get big. Check out this large one. 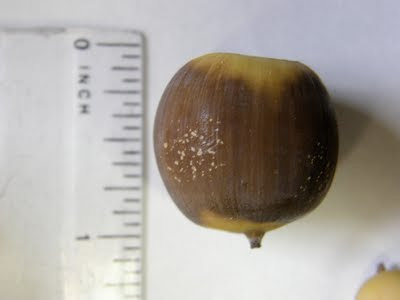 White Oak acorns can get even larger, up to about 1.25 inches. Average size seems to be somewhere between a nickel and a quarter though they can be much smaller as well. 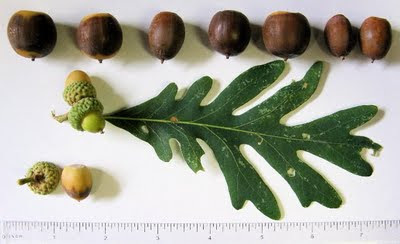 Here's a white oak leaf with a hand full of various size acorns. The ones still attached are small as they were still growing.